It’s not easy creating an eatery that’s authentic, truly unique and with real staying power on Sea Point’s vibrant Regent Road strip. There are a lot of superb restaurants here. And to stay relevant and exciting takes precision and dedication. 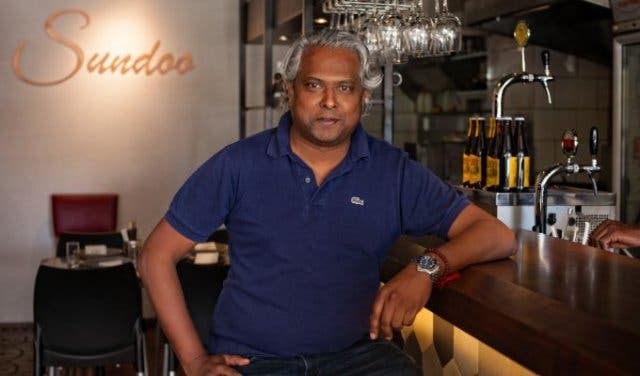 But that’s just what chef Seelan Sundoo – the man behind such restaurants as La Perla, the Grand Beach, Shimmy Beach Club and the Reserve Brasserie – has created in authentic Durban and South-Indian restaurant Sundoo. 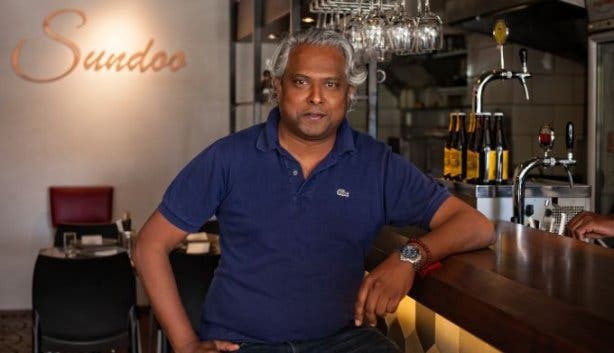 Some say his unique fusion of spices is the secret behind Sundoo’s success. 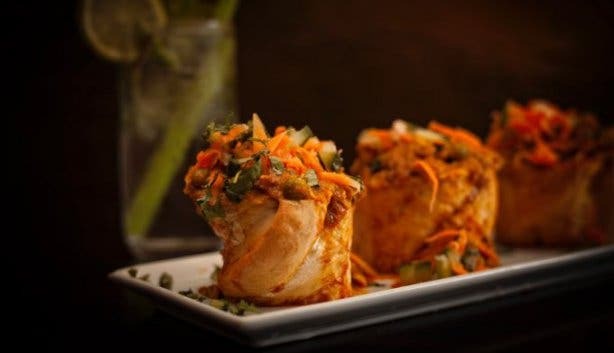 Others swear it’s the authentic Bunny Chow, served saucy and Durban style. But one thing’s certain: When the sun sets and the music rises above ambient level, Sundoo is an excellent place to soak up the authentically local vibes, Sea Point style. Like many local favourites, the Sundoo South Indian Tapas and Bar goes by its first name, Sundoo. Named after chef Seelan, Sundoo is as iconically Sea Point as the promenade. It’s not even about how old it is. Sundoo is still a teenager, having opened doors in 2015, on the cusp of Sea Point’s restaurant revival. What makes it so typically Sea Point is that it is cool and casual without being pretentious or trying to be Camps Bay. Sundoo embraces the energy of the streets. The restaurant’s large windows open onto the pavement, inviting guests in. The intimate seating area, limited to 42 seats, offers patrons a casual ambience, where the outside world blends with the inside for an easy stroll in, stroll out vibe that’s uniquely Sea Point but also offers something fresh and exciting to discover. “It is not a fine-dining restaurant, says Seelan. “We keep it fun and casual. 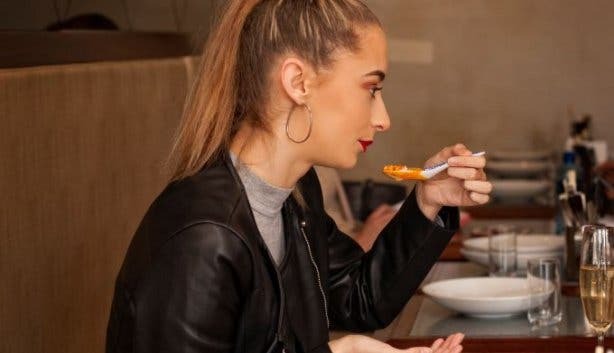 We use plastic cutlery and the bowls are already on the table, which everyone eats out of. The tables are rather small, too, and they’re tightly packed together,” says Seelan. Yet, at the same time, it’s interior is beautifully created – a hidden talent of Seelan’s is his secret passion for design – featuring hand-painted floors and handcrafted light boxes specifically designed for this space. 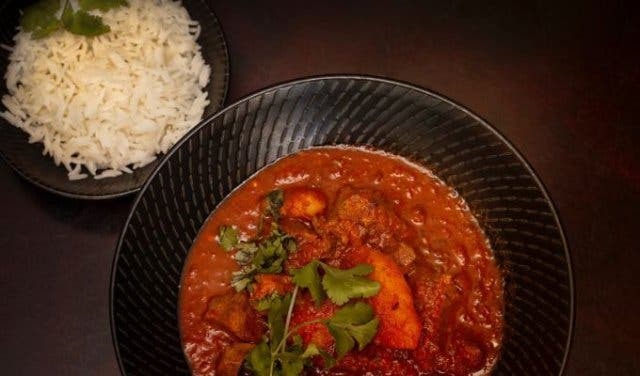 And then there’s the food: Sundoo is a restaurant that knows who it is and why it’s there – to bring its unique blend of delicious South-India-inspired food to the equally unique blend of cultures that call Sea Point home. This sense of a blending of cultures is something Seelan wanted to bring out in Sundoo’s food. 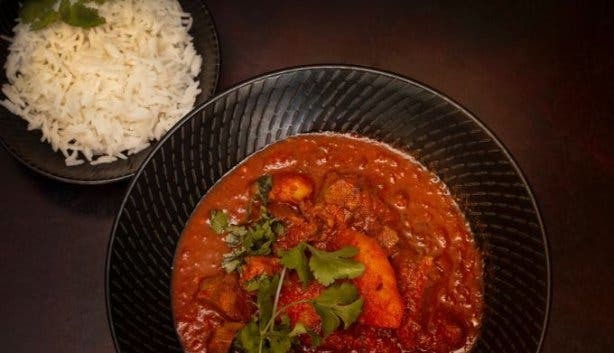 “I wanted to give people a piece of my heritage and allow them to enjoy it in their own way.” That’s why Seelan drew on his mother’s cooking, combining it with his love of spices and flavours to create a menu inspired by his South Indian roots, pays homage to the unique flavours of Durban yet feels at home in Cape Town. 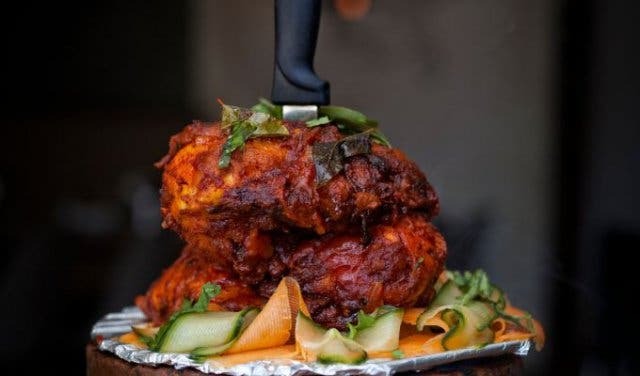 “Authentically unique” is probably the best way to describe Sundoo’s extensive menu, which includes Southern Indian classics like chicken briyani, lamb curry and even “Kerala roasted chicken”. But once you move past the samosas, rotis and jeera rice, you start to see how Seelan is adding his own signature style. The tapas naturally stand out. 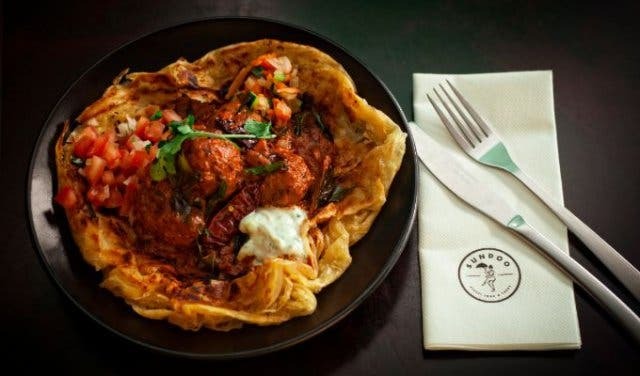 Here succulent wok-fried squid heads stand alongside a delicious Puri Paratha (a silky, fine and crispy flatbread from Southern Indian states Keralal and Tamil Nadu)with Tamarind sauce. And then there’s something quite unusual for an Indian restaurant – duck. Yes duck. Duck briyani and duck curry to be precise. Come early, though, they only prepare a certain amount of duck per day – see why under “Ayurvedic cooking” below. 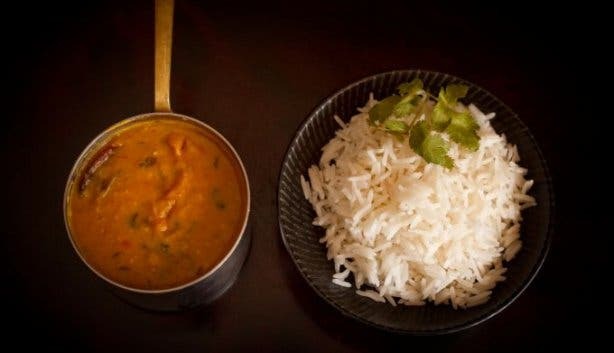 What makes Sundoo authentically South Indian is its adherence to the Ayurvedic cooking principles, which sees food as medicine and seeks out vegetables, herbs and spices known for their healing properties. 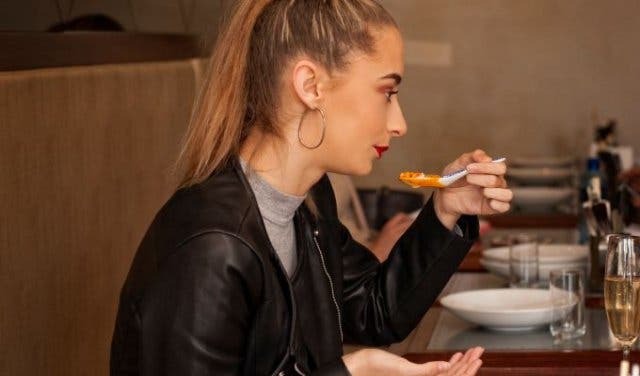 This means that most of the vegetarian dishes are also vegan, with no animal products like eggs or cream included in the sauces or preparation. Tradition also demands that the team make everything from scratch and use only the freshest ingredients. It’s another principle they stand by. At Sundoo, everything is homemade – from their secret spice blends to their hand-rolled samosas and homemade pickles and chutneys. On that note, if you are keen to try the duck dishes, arrive early because the kitchen only prepares small quantities of these and they sell out quickly. Like Sea Point itself, Sundoo has a day/night personality. By day, the restaurant is very relaxed, with a laid back atmosphere that lends itself to a quiet business lunch or solo sampling of tapas over a cold craft beer. In fact, lunchtime is the perfect time to sample Seelan’s style of cooking, with a range of light meals designed to do just that. Like the Thali, which serves up small portions of curries and sambals, or the roti wraps, which offer a taste of bigger things to come at dinner. But take your time. This is a good place to sit back and watch the unique blend of Sea Point locals saunter by. Or you could take in the beautiful artwork, like the photographs of South Indian people and scenes. And then there are the two giant wall “tattoos”, which are replicas of some of the oldest living Indian artefacts, now housed in Paris. Seelan’s good taste extends further into the restaurant, with simple details that make all the difference. Like the honeycomb tiles and hand-painted floors or the light boxes on the ceiling, which were handcrafted specifically for Sundoo. But probably the greatest feature is one that cannot be seen. The music. 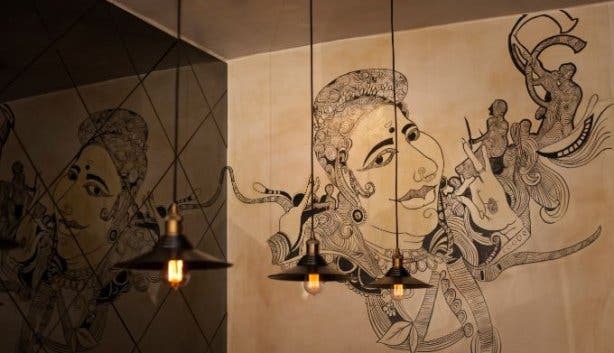 Described by Seelan as a “sort of spaghetti Indian-Western-type vibe”, the Tarantino-style Bollywood background music adds to the vibrant setting, especially at night when patrons come to enjoy the food as much as the vibe. 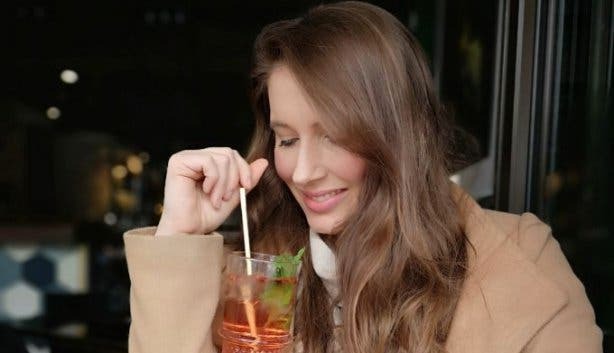 It’s the reason why most people are happy to wait for a table, inside at the bar or outside on the pavement where standing around feels more like socializing that queueing. So don’t be disheartened if you arrive at night to a full house. Tables turn quickly and Sundoo always makes a plan for its guests, which soon become family. They’re lekker and local that way. 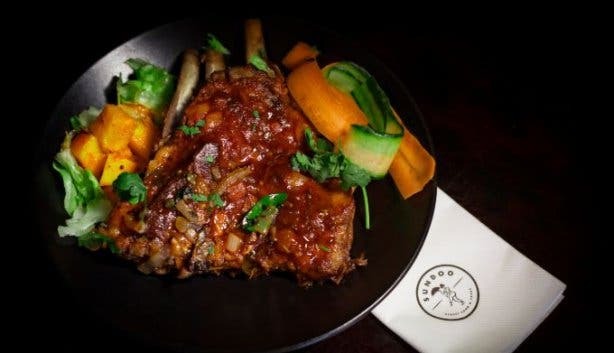 Tip: Sundoo’s kitchen is Halal friendly and does not serve pork or beef. All meat products are bought from a Halal-certified local butcher. 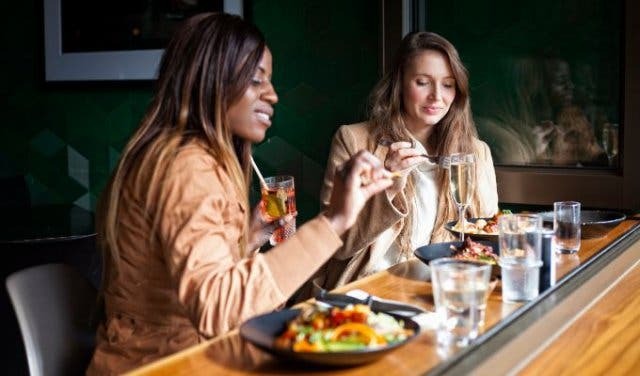 Sundoo likes to cater for the walk-in crowd, which is why it always had a no-bookings policy. That said, Seelan says you can now make a booking between 5–7pm for dinner, especially if you’re a group of 10 or more. Please phone ahead and speak with manager Touno, who will arrange a suitable time to accommodate your group. Generally speaking, patrons are encouraged to come early (from 6:30pm) to secure tables. Sundoo can be hired out at a fixed rate/minimum spend. The Bill: Tapas and starters range R40–R80. Mains cost R95–R170. Desserts range R40–R60. 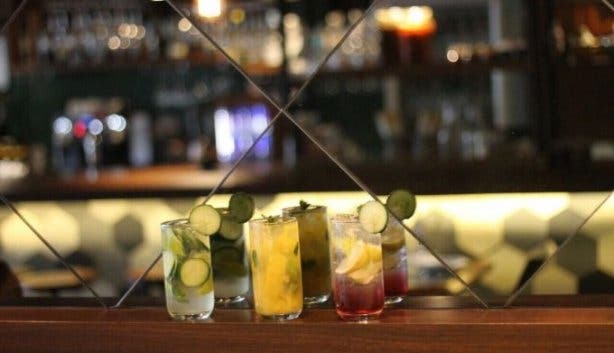 And Sundoo has a fully licensed bar offering a wide selection of wines, cocktails and ciders with two craft beers on tap. Check out Sundoo for business lunches in Cape Town, and slow, exotic dinners in Sea Point. 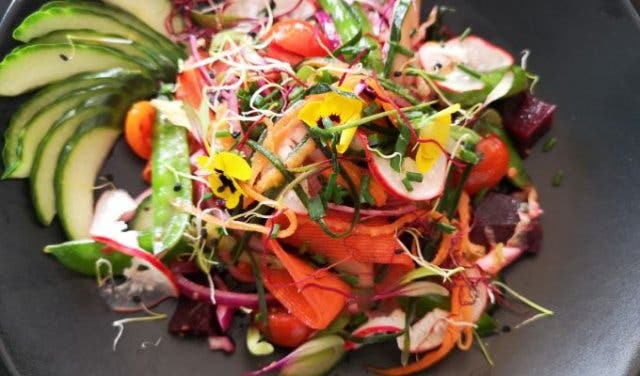 Alternatively, have a look at our selection of special vegetarian and vegan-friendly restaurants.